Made with natural rubber, pressure sensitive adhesive, this tape bonds to a wide variety of paper, film, fabric and yarn surfaces. It is printable with standard flexographic inks and is also easily marked with ballpoint pens, felt tip pens, pencils and rubber stamps. The thick, flatback paper backing creates good paint lines when used for masking purposes. Use also for banding items where color coding is required, last lap end roll tabbing of paper, film, fabric and yarns and light to medium bundling applications. 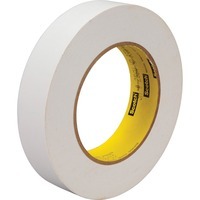 The tape detaches easily and provides clean removal from a variety of substrates.